Hi AMW readers! I hope international readers aren't swamped with the birthday giveaways! I am still "high" on my 33rd birthday because I'm telling to the universe that this is MY YEAR! Well I announce that every year but who cares? It is our choice to make our lives worthwhile! And I'm going for the positive path! I am very thankful to God for wonderful blessings! I've had a good share of makeup gigs and a lot I cannot post due to clients' request and I respect their decision :) But nevertheless, you guys know who you are and I'm thanking you for the trust! We all know the important role they play on any wedding day! They meet and talk to a lot of guests while the Groom awaits the bride and while the bride is waiting inside the car. With that thought in mind, I take care of the MOBs and MOGs with the same care I give to all my brides and grooms. One of the most quiet MOG I've met. She does not have any preference on her makeup. As I touched her face (with clean hands of course! ), I can't help but compliment her soft, supple skin! She has smooth skin to start with and she suffers only a few sun spots (almost invisible to the eye). I moisturized her face with an oil-free moisturizer and applied Paul & Joe Cream Foundation on her. Her lids are semi-hooded so I applied a good amount of eyelid primer, as eyeliner tends to smudge with hooded lids. On to the eyeshadow, I applied a matte neutral colored e/s to make her eyes appear "awake" adding up a lighter e/s color on the inner 1/4 of her lids and finished up with mascara and eyeliner application. I love her natural cheekbones so I enhanced it with contouring powder and I did not forget to contour her nose too! 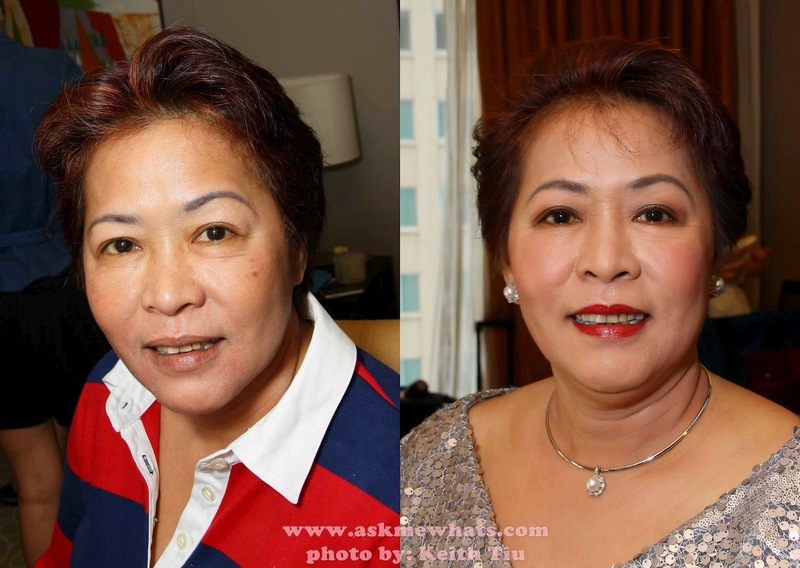 A peachy, healthy looking blush was applied for her to have a healthy glow with a matching peach colored lipstick. Request: Make her look picture perfect! MOB obviously takes care of her skin on a daily basis so I did not have a hard time choosing the type of foundation on her. I applied a good amount of moisturizer prior to foundation application patting her face with clean hands for the skin to absorb the moisture. I chose 2-3 shades lighter foundation from Calvin Klein because client suffers from skin acidity (meaning, foundation turns 2-3 shades darker a couple of minutes after application). As I wait for the foundation to oxidize and match her neck, I created darker looking eyes as MOB gave me the signal for heavier makeup application. With her eye makeup, I used the Beauty Pro Sweet and Smoky Palette (on client for the first time) and color payoff was really good and I'm happy with the result. For her cheeks, a very light matte pink blush which, as expected, turned a bit darker after the color oxidizes, the shade was my intention and I am happy with the way her cheek color complimented the red lips! To keep her lip color stay longer, I applied red pencil liner all over the lips before I applied MAC's Red She Said, blotting a bit of the moisture with a tissue and re-applied. 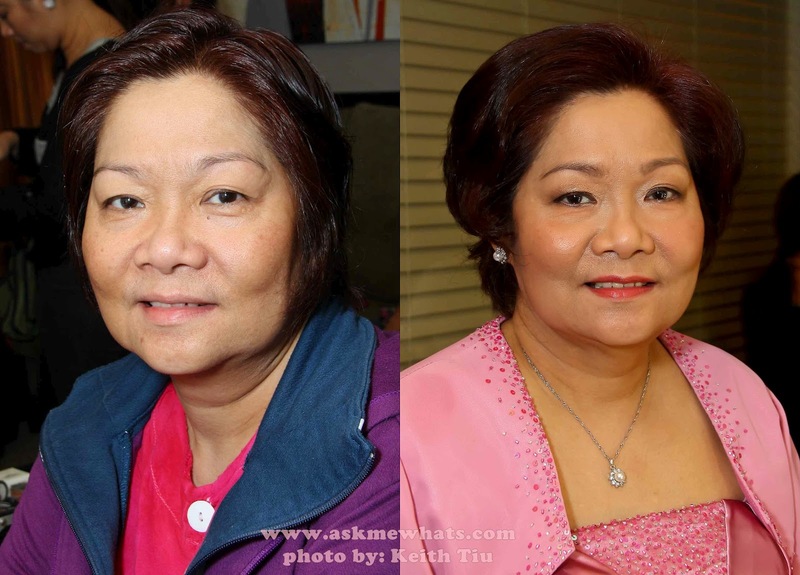 Is your mom or mother-in-law into makeup? wow! talaga? That's super cute! My mom isn't into makeup at all! I have to beg her to put some on her when we go to an event! Your work is magic! You make people look like their most beautiful possible selves! My mum isn't into makeup. At all lol. You did a wonderful job, as usual. They both look beautiful! HI sis, sige, I will try as Mr. AMW would kill me to put makeup on him! hahahhaha :) If I get the chance I'll write some tips :) Thanks dear! I love that so many of your clients agree to have their before and after pictures taken. It helps to see how you work with their natural beauty.